As an artist my primary interests and points of research have always been history, feminism and landscape, in that order. 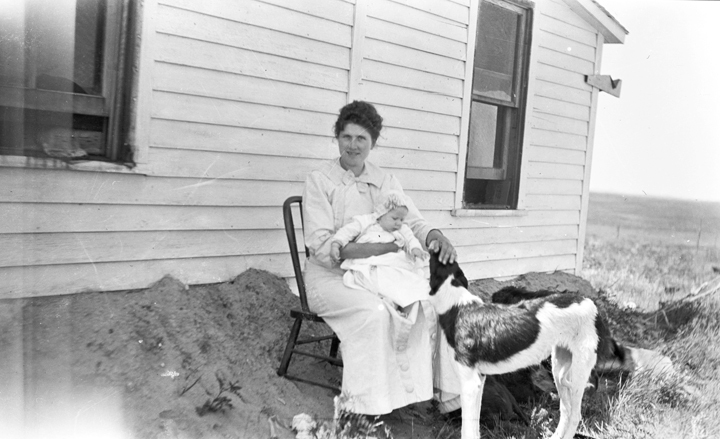 When I found a group of photos from the early 20th century depicting homesteading in Eastern Montana. The images commenced a chain of research into the elements of the imagery and the history of the American West. Most of our popular understanding of the American West are myths that coincide with a narrowly documented history that excluded women, among others, and promoted an imaginary romanticism about the colonization of the west. On the counter point I found New Western Historians such as Patricia Limerick and Glinda Riley who look at the fallacies of previous history writing and are essentially rewriting it. There are many more historians, histographers, writers and literary critics who work to expose the dominant popular myths of the west but there is a lack of visual artist addressing the topic. As an artist I am joining them in acknowledging there is more than one narrative to be be told about the history of the American West. Arthur O’Connor, came from a wealthy family, his father was a banker in Homer, Nebraska. 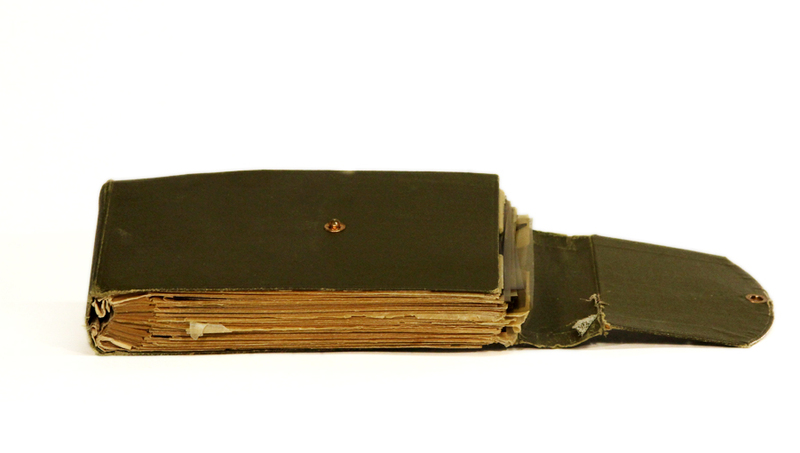 He was in a privileged position, where he traveled the West with his newly accessible technology, the camera, for adventure, and to treat his tuberculosis. The images among the negatives I was most interested in were taken when he married my Great Grandmother, Mable Johnson, and acquired a homestead in the Eastern Montana area of Ekalaka, Montana. 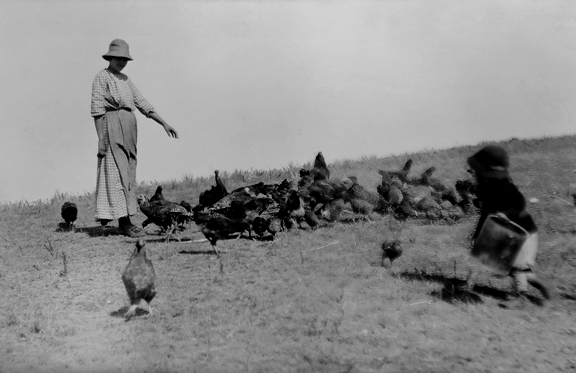 The photos of the homestead begin around 1910 and show the growing family on a desolate, arid, landscape, building a tiny house, trying to raise crops and poultry. As I researched these initial facts surrounding this set of photographs I began to discover how much political mythology and problematic history were attached to the images; the deep running inaccuracies of the actual written history and how it came to be that way. The myths of the west began to stack up in my reading and as a person born and raised in the west (Idaho) myself I was surprised at how many of the myths of the west I carried as truths in my own consciousness and supposed understanding. The invention of myths for entertainment, political, or financial gain are common occurrences in culture making their creation and perpetuation easily understood. How the myths of the American West were given academic and intellectual backing and how these ideas came to be ingrained in the writing of actual history starts with Frederick Jackson Turner. 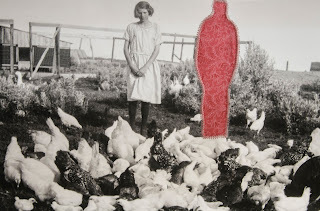 As a feminist artist I am drawn to the deletion of females from the history. Feminist historian Glinda Riley wrote an essay in 1993 titled “Frederick Jackson Turner Forgot the Ladies.” In addition to writing about Turner leaving women out of his history model she also looks at how and why he deleted women from the narrative. There were additional social and political forces at work that caused women to be deleted as Riley points out. Turner worked in a male dominated field, where there were no women to question his exclusion of them. While Turner’s work is praised for it’s originality, he still used prior historians work and those historians also deleted women, who usually saw them as unimportant supporters of men. The title of Riley’s essay comes from a statement by Abigail Adams, when she asked her husband John Adams to “not forget about the women” when writing the U.S. constitution, of course, he did not listen her to request. Other reasons women were deleted in Turner's thesis is that Turner himself was focused on political and economic history, and he wasn’t interested in groups of individuals or their narratives.9 So while half of the population moving West were women, sadly, through this combination of forces, their work, their lives, and their contributions were deemed unimportant and not worthy of recording for many decades. 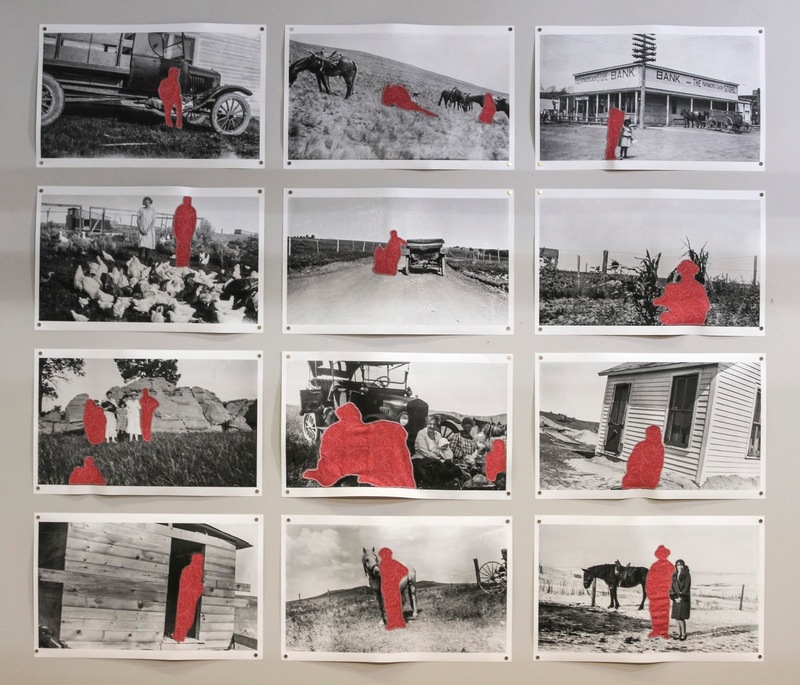 The deletion of women is only one problem in the Turner Thesis that is concurrently relevant in the photographs of the Eastern Montana Homesteaders. Another problem in Turner's thesis was his focus on the perpetuation of the Jeffersonian ideal of the small farmer. 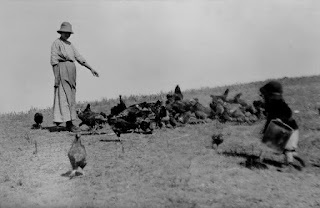 With this new understanding of feminist historiography and the work of The New Western History, I looked at the images, taken from my Great Grandfather, Arthur O’Connor on his eastern Montana homestead,which he acquired in about 1910, along with his new wife and growing family, with a different perspective. Any nostalgia and romanticism I had applied to them was a myth and the harsh reality of homesteading, colonization, the authoritarian ownership of the land, and the deletion of women’s hard work were seen instead. A new conversation had to take place with my Grandmother, the only living connection to the reality of my Great Grandmother's life. With new questions to ask her, I discovered my Great Grandfather was not a good provider. Being the son of a wealthy banker had left him, as well as many other people who attempted homesteading, under prepared for the conditions and tasks associated with homesteading. They lived in a small home with a dirt foundation. My Great Grandmother, Mable O’Connor, had six children. My Grandmother being the youngest born in 1925. The eldest, Arthur Junior, perished due to simple appendicitis but could not be saved due to a remote location, hours from any medical care. Arthur would often leave Mable alone with the children for long stretches of time while he wandered to find other work because the homestead could not support them. This is a far more typical narrative of homestead reality than is presented in the Western myth. Arthur O’Connor may or may not have known about Fredrick Jackson Turner’s lofty beliefs about the land but he was certainly playing into them. These original Kodak Brownie negatives were intended to be printed 1 to 1 directly onto photographic paper or on a handy postcards to mail. In the tradition of using the newest technology of the day, I scanned the negatives at a high resolution allowing me to get large clear prints on a large format printer. I selected images to print at 24” x 14”, their native ratio, which displays the details of the stark landscape and their small home with a dirt foundation. The foundation on which the O’Connors were convinced they would build their financial independence. My focus is on the deletion of “everyday” women from American history and the continued effect that deletion has had on women to this day. The ludicrousness of the seemingly bottomless misogyny that has been inflicted on the daily lives of women as well as the lack of value assigned to recording their lives, is the main idea I want to portray. I decided to visually reverse this sexism as an attempt to point out the true absurdity of the treatment of women. With a razor blade, I physically cut out the men from the reprinted photographs. 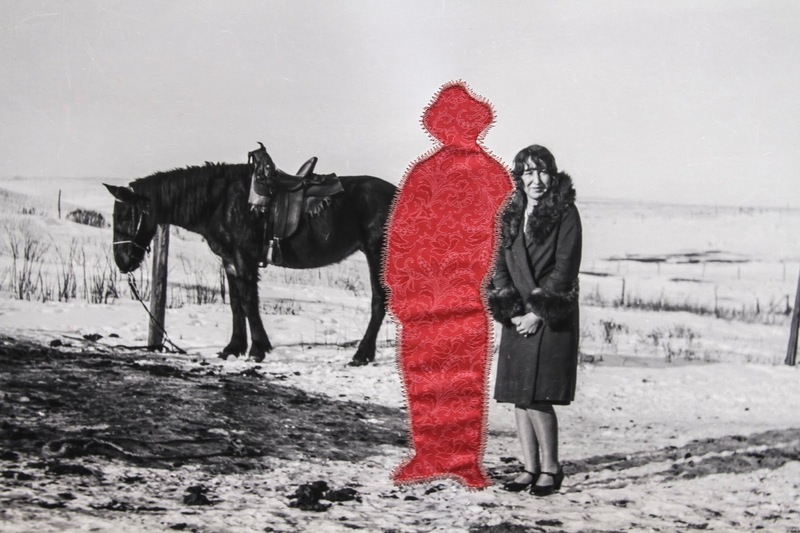 The fabric is then sewn into the photographs, a skill typically assigned to women, a labor necessary for survival to clothe the family in remote places on tiny budgets. 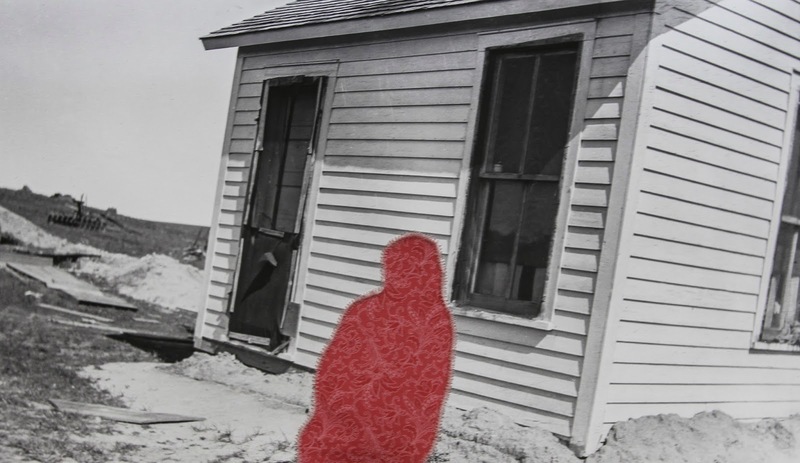 By removing the men from the photographs and replacing them with sewn patches of brightly colored floral fabric, the men become beautiful space holders, without details or context. The women, their actions, their likenesses are the only people seen. Then just as it has been with women, the men’s stories are deleted and we can instead create whatever narrative suites us for their spaces. 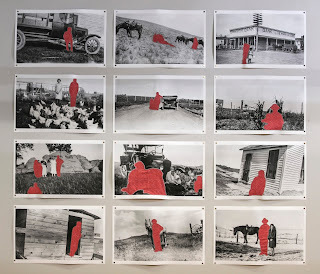 There are twelve of these images in my display: men removed, women left to try and create their fortunes in arid and desolate Eastern Montana on a politicized homestead. However, the story of the deleted women plays out in thousands of stories in not just the colonization of the west, but also in women’s histories around the globe. This deletion strongly affects women’s lives and attitudes about women to this day. Just as Frederick Jackson Turner changed the course of how Western American history was written, historians such as Patricia Limerick, with her influential writing “The Legacy of Conquest” along with other writings, try to change it again with the principles of the New Western History. As an artist I aim to visually exhibit this historiographic change, puncturing the myths of the west with emphasis on the everyday women’s stories to further the feminist cause of equality both historically and today. Jacquelyn A. Sparks “The Frontier Debate” The Frontier Debate. 10/2016. http://thepinkflamingo27.tripod.com/The_Frontier_Debate.htm. David H. Murdoch, The American West, The Invention of The Myth (Wales: Welsh Academic Press, 2001), 78. Barbara Howard Meldrum, “Introduction” in Old West - New West, Centennial Essays, ed.Barbara Howard Meldrum (Moscow, Idaho: University of Idaho Press, 1993), 1-2. David H. Murdoch, The American West, The Invention of The Myth (Wales: Welsh Academic Press, 2001), 80. Patricia Limerick, The Legacy of Conquest. (Canada: Penguin Books, 1987), 21. Patricia Limerick, “What Raymond Chandler Knew” in Old West - New West, Centennial Essays, ed.Barbara Howard Meldrum. (Moscow, Idaho: University of Idaho Press, 1993), 32. Patricia Limerick, The Legacy of Conquest. (Canada: Penguin Books, 1987), 58. Gerald D. Nash, “New Approaches to the American West” in Old West - New West, Centennial Essays, ed.Barbara Howard Meldrum (Moscow, Idaho: University of Idaho Press, 1993),19. Limerick, Patricia, The Legacy of Conquest. Canada: Penguin Books, 1987. Limerick, Patricia, “What on Earth is the New Western History?” in Does the Frontier Experience Make America Exceptional?, ed. Etulain, Richard W., and Frederick Jackson Turner. Boston: Bedford/St. Martin's, 1999. Limerick, Patricia, “What Raymond Chandler Knew” in Old West - New West, Centennial Essays, ed.Barbara Howard Meldrum. Moscow, Idaho: University of Idaho Press, 1993. Meldrum, Barbara Howard, “Introduction” in Old West - New West, Centennial Essays, ed.Barbara Howard Meldrum. Moscow, Idaho: University of Idaho Press, 1993. Nash, Gerald D. “New Approaches to the American West” in Old West - New West, Centennial Essays, ed.Barbara Howard Meldrum. Moscow, Idaho: University of Idaho Press, 1993. Riley, Glinda. “Frederick Jackson Turner Forgot the Ladies” in Does the frontier experience make America exceptional?, ed. Etulain, Richard W., and Frederick Jackson Turner. Boston: Bedford/St. Martin's, 1999.